James is a lovely reminder that at all of our public events, you never know when there is a future Lancer among you. He started off coming to our annual open house for a pony ride at age three. James then had to suffer through a long time on our waitlist but he was grateful that we had our summer camps to keep his horse bug alive until a space opened up for him in our junior beginner course. He started in the junior course in September 2017 and is now in ride 9. At the Open House, James had a pony ride on Jake and when he started in the beginner course, he finally had the chance to ride Jake “for real”. His favourite all-time horse was Zero who is now retired but he also really enjoys Alice. James’ mum Alison had riding experience and more recently joined Lancers as well and James’ sister Jess is also now on the waitlist for the junior beginner course! It shall be a family affair and we are looking forward to it! James, along with his ride-mates, is some of the most helpful at Lancers. Despite their young age, they have already learned how to take initiative and the barn is always well-kept and spotless when they have been around. They took this helpfulness further this summer when we had our strangles quarantine. James and his friends felt so compelled to do something and the way they knew they could, was through a bake sale! So, with the help of friends and family, they baked up a storm and held two bake sales which were pleasantly profitable. James and his sister Jess have even been selling some of their old toys and sharing the proceeds with Lancers. James is always thinking of how to give to Lancers and improve things here. Even yesterday he came by the office and dropped off new sponges for the tack room! He has only been riding for just over a year, James has already participated in a number of training shows and he attended our Salmon River camp. At camp, James learned to expand his comfort zone in ways that impressed many of the older riders around him. He also does this regularly in his lessons where he always pushes himself through difficult scenarios where others might be inclined to give up. While riding can be scary, and riders often have to be brave and push to do things even when they are a bit scared. James is a great example of this stoicism. For instance, James’ self-proclaimed favourite memory from Lancers is falling off for the first time up at A on the right rein when Tootsie took off after Alice. 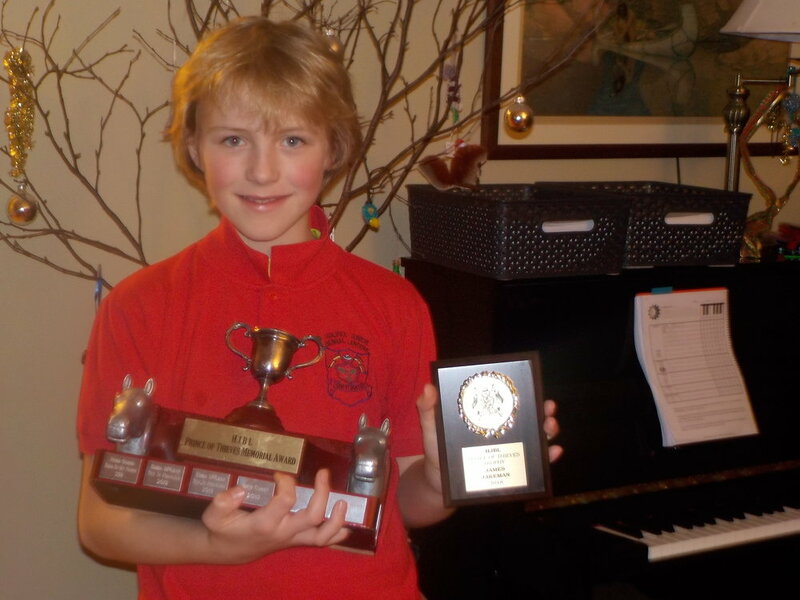 Most recently at our annual Christmas party and awards ceremony, James was the recipient of our Prince of Thieves Memorial trophy which is given out each year to a rider who displays a strong sense of sportsmanship. While these trophies are often awarded to our more experienced riders, this particular year we all felt that James embodied sportsmanship and Lancer values to such a high degree that it could not be ignored. 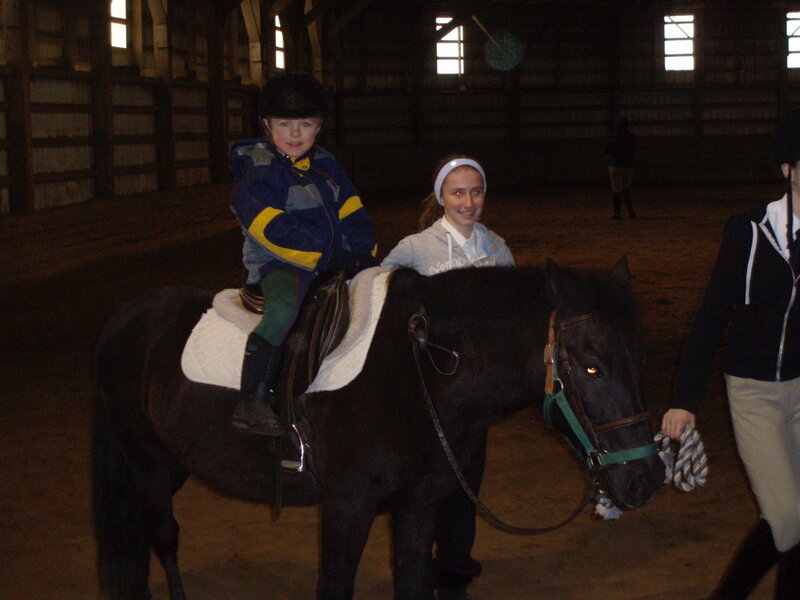 James enjoys making friends and riding horses at Lancers. In the future, he would like to spend even more time with the horses and we can’t wait to see this dream coming true and hope to see him in the Musical Ride and in our other activities as he progresses. James is a very busy person and also enjoys soccer, tennis, skiing, and swimming. His hobbies include playing the piano and with his electric trains! We are so pleased to have James as a Lancer for he truly exhibits the Lancer spirit! Photos: The grey (Toller) and the roan (Midge) are at a stable in England. James took the "artsy" foursome one at Salmon River this summer. He was bitterly disappointed with his collection of photos from that week, but one is a cracker!